My sweet tooth is big, like really big! Typically before a weekend visit to see my sister in New York, we spend some time browsing Instagram for where we should go to eat. Because a weekend in NYC always revolves around food for me (besides my fam and friends of course!). 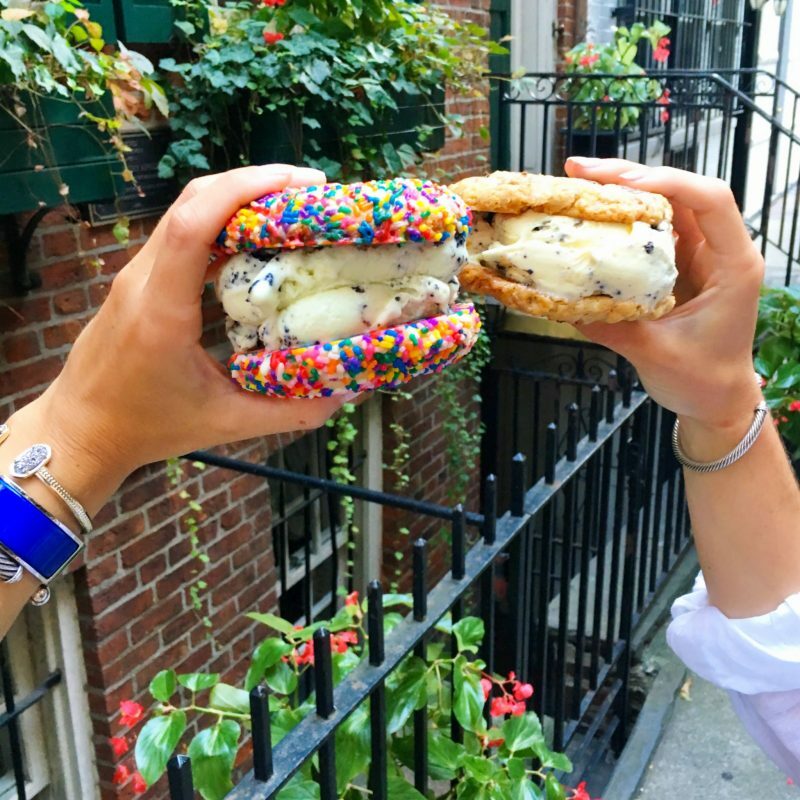 From ice cream to milkshakes to doughnuts to cookie dough, these five sweet treats are the best way to indulge your sweet tooth while in New York City. Apologies in advance as all of these pictures are iPhone snaps- I promise everything tastes even better than it looks! Ice cream at Big Gay Ice Cream: Another place I learned about exclusively from Instagram, Big Gay Ice Cream has some super yummy soft serve ice cream concoctions in the heart of the West Village (and other places too!). 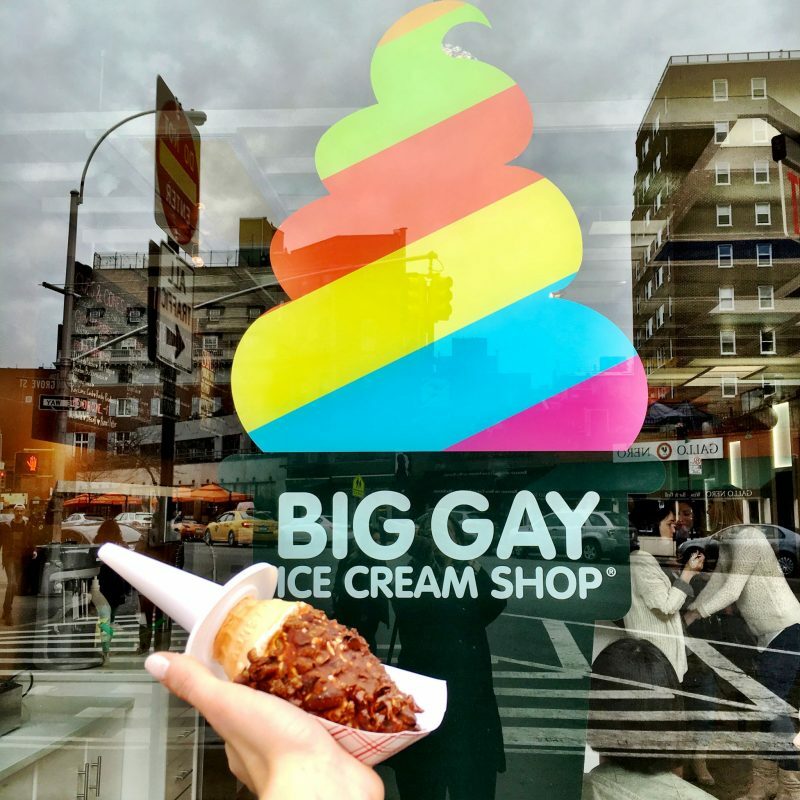 Big Gay offers traditional dipped cones or specials like the Salty Pimp cone- a personal favorite with salted caramel. They say their mission is to bring fun back into ice cream and with their colorful store and ode to the Golden Girls inside and unique cone names, I think they’ve succeeded! Croissant Donuts at The Donut Pub :Just a few blocks away from my sister’s place, this unassuming diner looking donut shop was awesome! 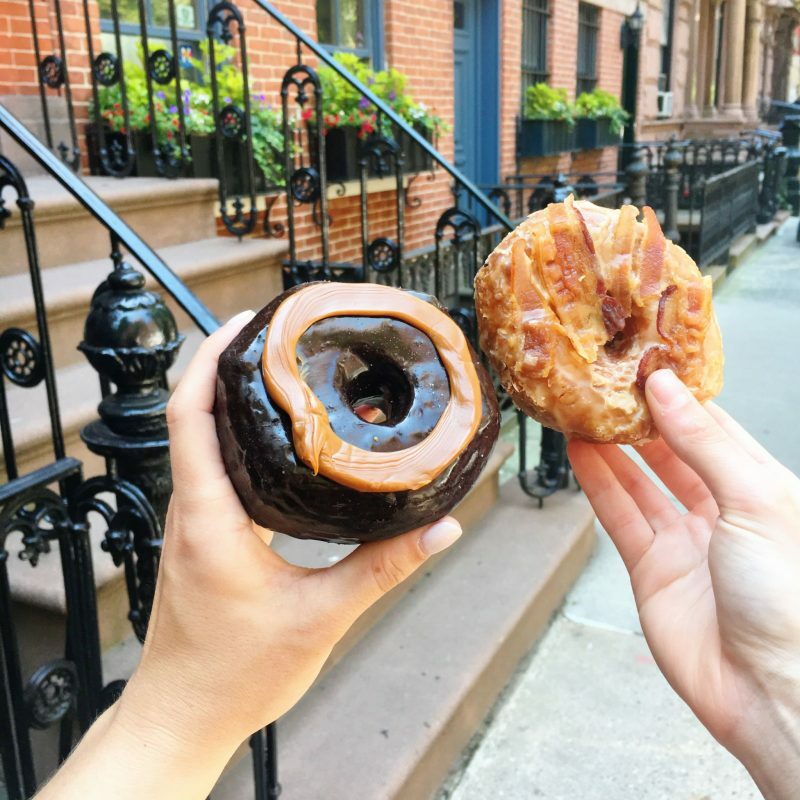 We shared the salted caremel croissant donut and the maple bacon croissant donut. Both were fabulous! Cookie dough cones at Do: I don’t think I’ve ever wanted to try a dessert more than I wanted to get a cookie dough cone from Do! My sis and I love cookie dough (like the kind you make at home with a chance of salmonella 😉 ) so we knew we had to visit this spot. I had the confetti in a vanilla (aka pink) cone. 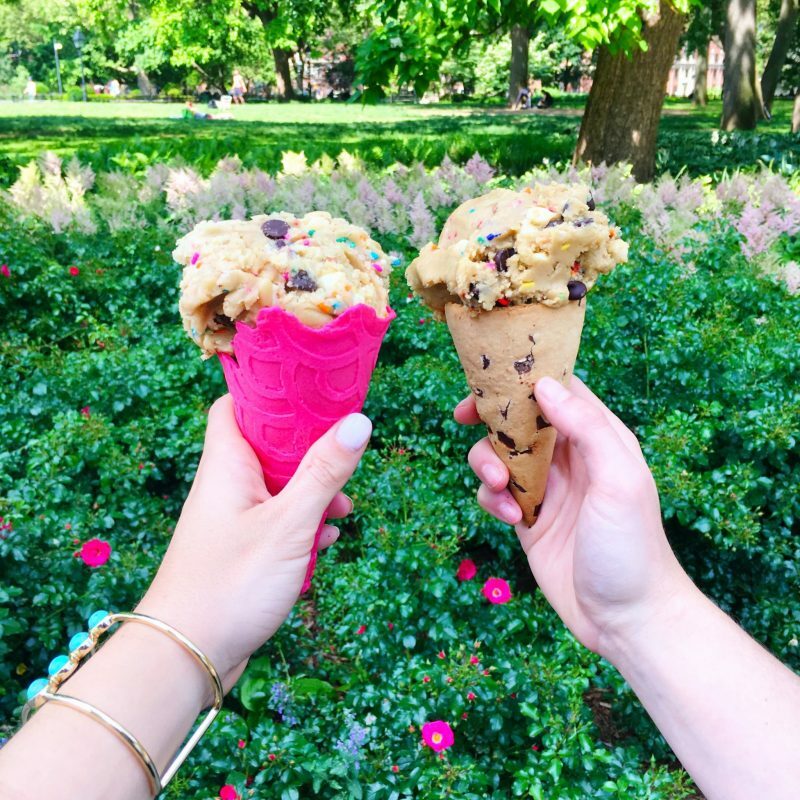 While we were walking and hanging out in Washington Square Park after getting these treats, about ten different people asked us where to get the cones. It may have been because it looked really good or because we were eating cones at 11 am- either or 🙂 . After a failed attempt at getting them on a Friday afternoon around 3 PM due to a super long line, we decided to go back right when they opened on Sunday morning 10 am. It was our version of brunch that day! Make sure you read the details on the line before you go so you aren’t disappointed as they stop the line a bit before they actually close. 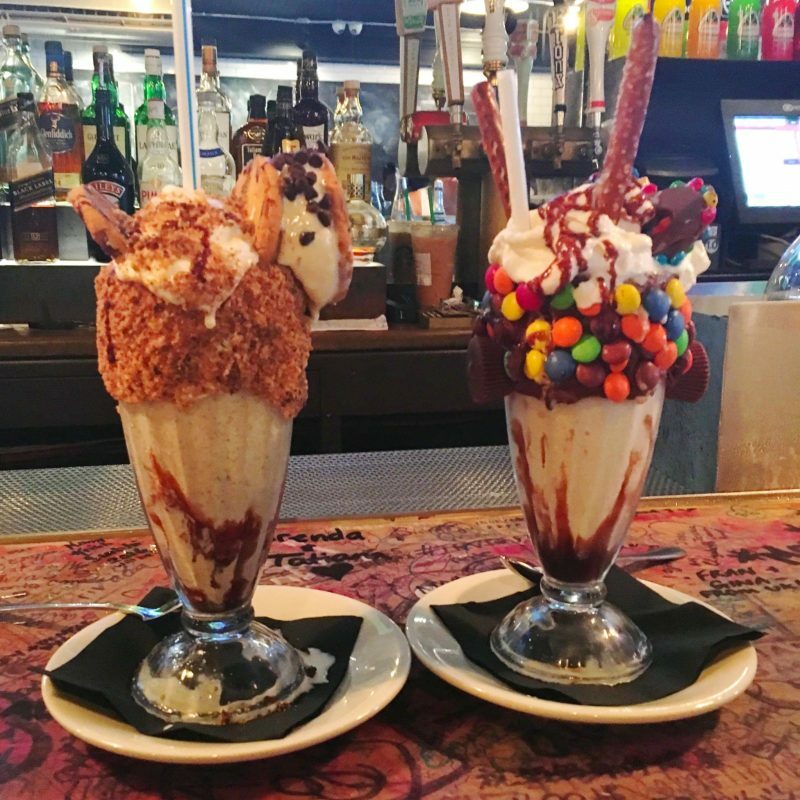 Milkshakes at Black Tap– You’ve probably seen these milkshakes on Instagram just like we did. Black Tap makes the craziest milkshakes in New York- I mean they have milkshakes with legit whole pieces of cake on top! We had the sweet & salty shake and the cookie shake- both were amazing. While there is often a wait to get in, trust me that it is worth it! We visited the 14th Street location and waited in line about 40 minutes on a Saturday afternoon in June. 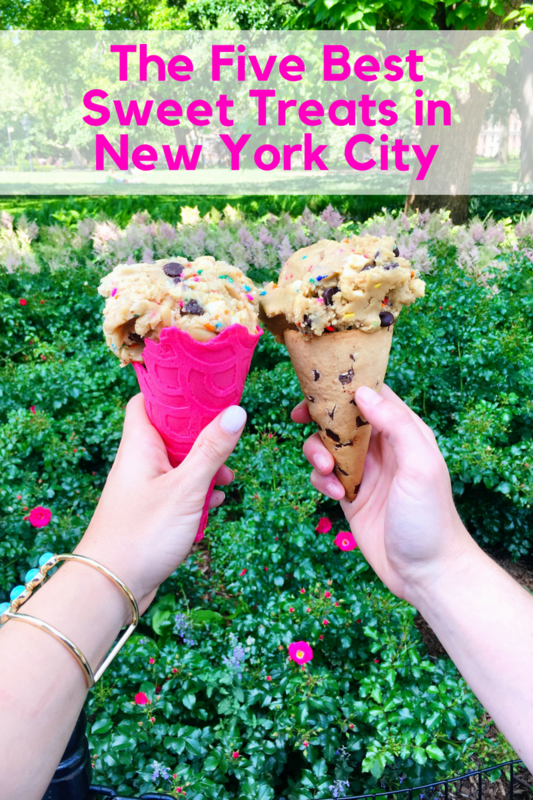 Any favorite sweet treats in New York that I missed? I’ll add them to my list for next time! It is so good! I hope you get to try it and love it!